The IT czar has kept TCS on a high-growth path despite the persisting economic uncertainty. Natarajan Chandrasekaran loves his daily run and often talks about it. "Today, I ran 16 km till Nariman Point," he says with a smile when Business Today meets him at his home-office at Worli, Mumbai. The CEO and managing director of Tata Consultancy Services (TCS), who has a family history of diabetes, started running in 2007 to improve his fitness level. The marathon runner has changed in many other ways since then as well. He has become more persevering, patient and observant - desirable qualities for one who leads a company of 285,250 people. He is also more relaxed. "I used to be more tense as chief operating officer and in my earlier years," he says. He is dressed simply in a plaid shirt, jeans and slippers. "I am not tense at all now." 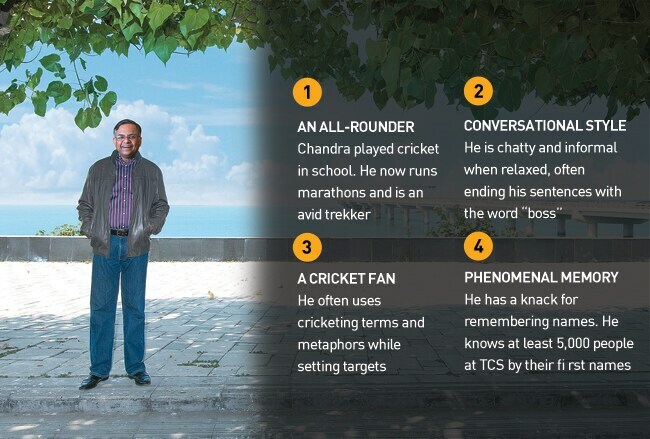 Chandrasekaran, or Chandra as he is popularly known, may not be the only TCS executive enjoying peace of mind. The fast-paced growth India's largest software services exporter has recorded since Chandra took over as CEO in October 2009 would make any company executive stress-free. TCS has nearly doubled its revenue in the past four years to $11.6 billion for the year ended March 2013. It has grown at a compound annual rate of 21 per cent despite a crippling slowdown in its main markets of North America and Europe. The company also led Business Today's list of 500 most valuable companies in India for the second year in a row and has widened the gap with second-placed Reliance Industries. Chandra's old friends believe he is a corporate legend in the making. His story has the familiar 'filmi' trappings of a small-town guy making it big - from a village called Mohanur in Tamil Nadu where he grew up, to his current sea-facing apartment, Sagar Darshan, in the country's business capital. Chandra lives on the second floor of the apartment with wife Lalitha and 15-year-old son Pranav. The office is on the first floor. It is intricately designed in classic European style with vintage porcelain vases, statues, candle stands, clocks and chandeliers complementing vintage-like furniture. The only Indian touch are the paintings on the walls, one of them - of the ghats of Varanasi - by Pune-based landscape artist Govind Dumbre. The home-office also has video conferencing facilities, a gym, bedrooms, and a bar where Chandra settles down with single malt in the evenings. The only things modest about the apartment are an old, manually operated, two-door elevator and the CEO's yellow Nano minicar, which is parked beside his black Mercedes. All this is a world apart from his early life. Chandra was born in an agricultural family and had five siblings. His father, Srinivasan Natarajan, was a lawyer by profession but also managed the family farm that grew bananas, rice and sugarcane. Even Chandra tried farming for six months before realising it was not his cup of tea. He studied in a Tamil-medium government school and switched to English-medium for the senior secondary exams. He graduated from the Coimbatore Institute of Technology with a degree in applied sciences and completed his postgraduate degree in computer applications from Regional Engineering College, Tiruchirappalli. "I remember Chandru (his friends called him Chandru) as a focused and hard-working student during our college days," says Nandakumar V., his hostel mate at REC Tiruchirappalli, in an email. Chandra was not athletic at this stage, though he had played some cricket, batting a bit, bowling a bit, in school. Nandakumar moved to the United States in 1989 and now runs a company called Yes-M Systems LLC in Atlanta. 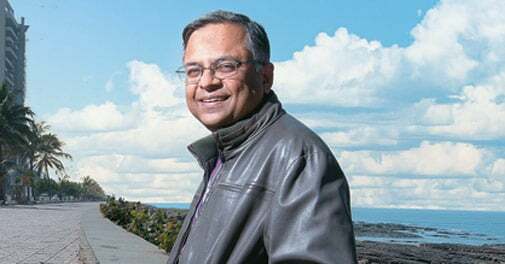 He kept interacting with his college friend whenever Chandra visited North America to handle TCS projects in the late 1980s and early 1990s. Even at the time, says Nandakumar, Chandra aspired for leadership roles. Chandra never attended any management school. Nor does he read much management literature. His lessons in running a company have come from real-life experiences. Of course, he benefited immensely from the platform he inherited from S. Ramadorai, his predecessor. A strong delivery mindset was already part of the company's DNA when he took over as CEO. He also flourished because TCS is part of the Tata group. "The group is professionally managed, so I get to run the show. For me, it is the enormous freedom to operate. Then there is the strong value system of the group," says Chandra. One of Chandrasekaran's early influences was his father, who wanted him to document every rupee he spent. He learnt lessons in frugality, honesty and perseverance from his father. "Every time I wanted to do something, he would ask if I am committing myself for the long term or was it for the short term. He would say whenever you have to do a one-off thing, you don't have to think much. Long-term commitments have to be thought through," says Chandra. Chandra remembers an incident that influenced the way he looks after his people. In the government school in Mohanur, when he was in the sixth grade, Chandra could not attend classes for more than two months because of a surgery he underwent. His class teacher, Kannammal, kept for him the complete notes of what was taught in every subject during his absence. "The teacher didn't have to do that. I didn't think about it so much at that time. Many of these things come to my mind now," he says in a reflective tone. "Now I think about what it means to take care of people. You work in a team. Somebody or the other will always need help. It is important to spend the time to help him." In the early stages of his career at TCS, Chandra learnt vital management lessons from customers. Around 1993, he was working on a very large US federal government programme. In the first phase of the project, TCS did a spectacular job. On the day the second phase was about to go live, the client manager came up to Chandra and asked him out to lunch. Chandra was alarmed. The system was going live and he felt he had to stay in the office. But the client manager was persistent. "I was very restless in the car. There were no mobile phones those days - no one could have reached me," he says. "The client manager then said he needed to find out who could step into my shoes. Somebody needed to handle the job when I wasn't around." That was a lesson in delegating, trusting people and risk taking. A recent incident highlights Chandra's risk-taking spirit. In September this year TCS was up against four competitors in Saudi Arabia to set up a business process outsourcing (BPO) centre that would service clients such as state-run energy giant Saudi Aramco and US conglomerate General Electric. Abid Ali Neemuchwala, who heads TCS's BPO business, was speaking to Chandra about the project when the CEO suddenly popped the question - why not set up an all-women centre? This was unheard of in the deeply conservative Islamic kingdom. "It created a competitive advantage and became a very unique proposition. This shows his ability to think out of the box," says Neemuchwala. Pradeep Udhas, Head of Markets at consultancy KPMG India, feels Chandra's grip over whatever is happening in the company is awesome. Brother of ghazal singer Pankaj Udhas, Pradeep is a singer and composer himself and Chandra has attended his performances. "There are two different types of brains. Some leaders are very good with the macro picture and the vision. Some are more detailoriented," says Udhas, who has known Chandra for 23 years. "He has this great ability to see the big picture and, at the same time, go down to minute levels of detail. Even while leading a $12 billion company, he would know about a $2 million project TCS is pitching for." Chandra's control over the firm does not mean he is a micro-manager. His trusting nature allows his executives enough freedom to operate. But he sets ambitious targets and his reviews are intense. "I feel I am in review every day. He knows every single thing about my unit," says Pratik Pal, head of TCS's retail business. "When I go to make a presentation to a customer in the US - when it's 3 a.m. in India - I get an SMS from him, 'How is the preparation?' After two hours, I get another SMS, 'How was the presentation?' He remembers a presentation even if I had told him about it two weeks before," says Pal. Chandra also has a phenomenal capacity for remembering people - some executives claim he knows at least 5,000 of them by their names. Corridor conversations with him can revolve around not only the executives themselves but also their families. The personal touch allows the CEO to remain connected with employees. While remembering so many names appears superhuman, research from Kansas State University last year said it was not brain power alone that determined a person's ability to remember names. It was his level of interest in people and the desire to understand them that mattered. This ability is found in people who are more socially aware. Chandra definitely is. He also has a soft side. He once flew back from the US to attend to his dog Ray, a Beagle, who had cancer. Ray died earlier this year at age seven, after struggling with the disease for many months. "He was a good guy," Chandra says. "We have been thinking of getting a new dog. We will wait till my son finishes his Class X exams."